It is now five years since I delivered a charge to you on some parts and points of masonry. As one branch or superstructure of the foundation, I endeavored to show you the duty of a mason to a mason, and of charity and love to all mankind, as the work and image of the great God and the Father of the human race. I shall now attempt to show you that it is our duty to sympathise with our fellow-men under their troubles, and with the families of our brethren who are gone, we hope, to the Grand Lodge above. We are to have sympathy, but this, after all, is not to be confined to parties or colors, nor to towns or states, nor to a kingdom, but to the kingdoms of the whole earth, over whom Christ the King is head and grand master for all in distress. Among these numerous sons and daughters of distress, let us see our friends and brethren; and first let us see them dragged from their native country, by the iron hand of tyranny and oppression, from their dear friends and connections, with weeping eyes and aching hearts, to a strange land, and among a strange people, whose tender mercies are cruel,—and there to bear the iron yoke of slavery and cruelty, till death, as a friend, shall relieve them. And must not the unhappy condition of these, our fellow-men, draw forth our hearty prayers and wishes for their deliverance from those merchants and traders, whose characters you have described in Revelation xviii. 11-13? And who knows but these same sort of traders may, in a short time, in like manner bewail the loss of the African traffic, to their shame and confusion? The day dawns now in some of the West India Islands. God can and will change their condition and their hearts, too, and let Boston and the world know that He hath no respect of persons, and that bulwark of envy, pride, scorn and contempt, which is so visible in some, shall fall. Now, my brethren, nothing is stable; all things are changeable. Let us seek those things which are sure and steadfast, and let us pray God that, while we remain here, he would give us the grace of patience, and strength to bear up under all our troubles, which, at this day, God knows, we have our share of. Patience, I say; for were we not possessed of a great measure of it, we could not bear up under the daily insults we meet with in the streets of Boston, much more on public days of recreation. How, at such times, are we shamefully abused, and that to such a degree, that we may truly be said to carry our lives in our hands, and the arrows of death are flying about our heads. My brethren, let us not be cast down under these and many other abuses we at present are laboring under,—for the darkest hour is just before the break of day. My brethren, let us remember what a dark day it was with our African brethren, six years ago, in the French West Indies. Nothing but the snap of the whip was heard, from morning to evening. Hanging, breaking on the wheel, burning, and all manner of tortures, were inflicted on those unhappy people. But, blessed be God, the scene is changed. They now confess that God hath no respect of persons, and therefore, receive them as their friends, and treat them as brothers. Thus doth Ethiopia stretch forth her hand from slavery, to freedom and equality. Brother Prince Hall, An address delivered to the African Lodge at West Cambridge, Massachusetts on June 24, 1797. Source: The Black Past. Image: Schomburg Center for Research in Black Culture, Photographs and Prints Division, The New York Public Library. 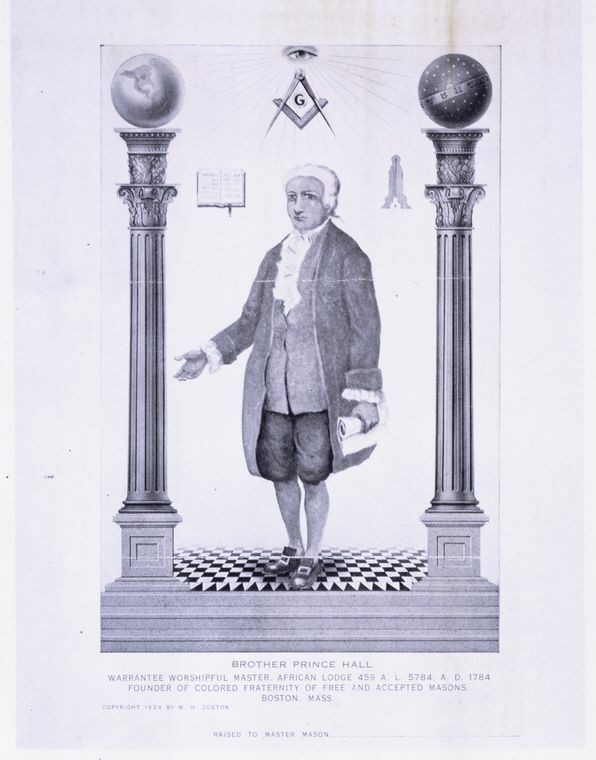 “Brother Prince Hall [ca. 1735-1807].” The New York Public Library Digital Collections. This entry was posted in Uncategorized and tagged africa, Black, Haiti, history, pan-africanism, revolution, Saint-Domingue, United States. Bookmark the permalink. Post a comment or leave a trackback: Trackback URL.